PENTHOUSE WITH VIEWS! Boutique building in a quiet neighbourhood, with only 2 units on the top floor. Come home to a bright and airy space with beautiful outlooks and windows on 3 sides allowing for lots of natural light. Open concept living/dining room with adjacent patio. Living room boasts high ceilings, a cozy gas fireplace with stone surround, and floor to ceiling windows with California shutters. Enjoy two oversized balconies with lots of privacy. Fully renovated this past year, this home is beautiful both inside and out. 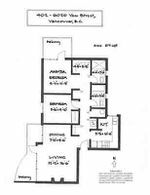 Spacious master bedroom with large skylight, walk-in closet and ensuite with oversized shower. 2 parking and one storage locker. Enjoy the convenience with close proximity to transit, restaurants and shopping in Kerrisdale Village.